Courtesy of Asociación de Cruce A Nado Del Estrecho De Gibraltar. The Asociación de Cruce A Nado Del Estrecho De Gibraltar writes, "We say goodbye to one of the most difficult seasons for ACNEG, the loss of our president, leaving a big gap not only in the hearts of all swimmers who got a dream under their indications, [but also] those swimmers who [will attempt] it thanks to him. Also it leaves a great void in a team that has continued the activity on very hard days, as well as in his family. He formed the foundations of the current Association of Crossing the Strait of Gibraltar back in 1999, after several years helping and advising those swimmers who arrived to the Tarifa coast from different parts of the world, with the intention to get what only a few swimmers achieved. The demand was growing as well as the need to create, with the competent authorities, regulatory bases and security measures, the same ones that today allow the crossing of the waters of the Strait. We will continue in a close relationship with the maritime authorities with the mission of promoting, organizing, controlling and carrying out the crossings unifying the criteria and ensuring their smooth running. But we must be eternally grateful to our forever president." 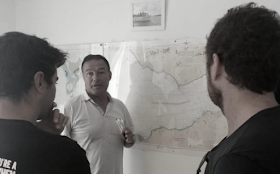 Gutiérrez explained the history of swimming across the Strait of Gibraltar to Revista Open Swim in March 2016. "Two English ladies Mercedes Gleitze and Miss Hudson made the attempt to cross from the city of Tangier with the intention of reaching the city of Gibraltar. They did not succeed because the route selected was not the most appropriate. 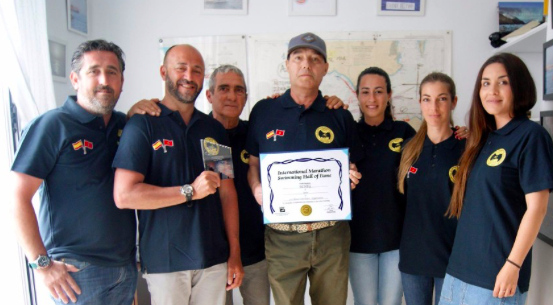 A year later, Mercedes Gleitze tried again, this time from the city of Tarifa arriving at the neighboring coast of Morocco in 12 hours 50 minutes. It was a 5th of April, Holy Thursday." Until 1999, locals had been helping swimmers attempt and cross the Strait together with the Red Cross. "This made us reflect and reach the conclusion that there was a need for an organization that will provide the swimmers with the procedures involved in a crossing, as well as technical and material advice to make the crossing. Following the model of the Channel Swimming Association, we started and founded the ACNEG." 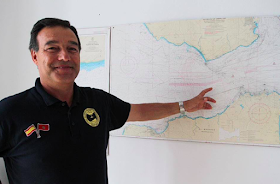 As of 2016, Gutiérrez and his colleagues had helped and overseen 455 solo crossings, 519 crossings with a wetsuit, 20 crossing for relays and 11 two-way crossings. "We can make an average of 50 crosses per year with a maximum of 4 swimmers per crossing. Although everything depends on the weather accompanying from April until the end of October,." He remained realistic and reasonable in managing expectations from swimmers around the world. "We have requests from all over the world. There are hundreds of requests of which we can only answer some accounts every year. Keep in mind that there are many repetitions of crosses that can not be done by the weather, as well as requests that have been waiting for several years." His work and organization was recognized this year by the International Marathon Swimming Hall of Fame [see photo above], a tribute to his work over the last two decades. He is missed greatly, but his legacy will live on.